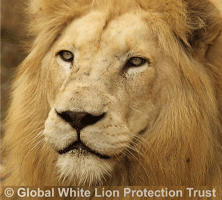 White Lions have come at times of great upheaval and change on our planet and then gone extinct. The gene lives on in other great lions, only to surface when humankind seems to be facing some natural peril which inaugurates a shift in human consciousness. The last time was during our last Ice age which we are now overdue to have again. The Earth has regularly gone through extinction scenarios that bring us into greater awareness and spiritual enlightenment. The White Lion is built and coloured for great snow and ice and hearty survival. So, why are they reappearing once again in arid Africa? African prophesies, much like the Hopi prophecies regarding the birth of a White Buffalo heralding the ending of a great cycle of life and the beginning of a new one, lead us back to the roots of these Great Cats in all ancient civilizations as the heart of humanity and the soul of Nature herself, reminding us that we are unified with all species and connected to the stars. We of the 21st century have all but forgotten this inherent fabric of unity and have lost our own hearts along the way. Linda Tucker has done pain staking research and work with renowned archaeologists, Egyptian historians, African Shamans, keepers of African lore and astro-archaeologists. The unprecedented connection between the White Lion and priests, kings, prophets and seers throughout history has its deep connection to the stars, the constellation of Leo and the beings that helped in the construction of the pyramids, the Sphinx and all astronomical sites like Stonehenge. The White Lion bridges humans to not only their own true spiritual nature of love but to the stars themselves. As with the Lion of Judah, the Lions of God bring a message of Christ Consciousness, one of unity and of ancient truth that can help humanity transform through the coming changes. If we listen. As long as we can kill a magnificent animal for fun, for the thrill of the kill, we remain a soulless society. As long as each of us stand still doing nothing, we are no less the perpetrator we revile. It is time to stop the killing of everything sacred and take a stand for ….Love. It is time to listen to the heart. Taken from the whitelionwisdom.com. Read up more about this at their website.